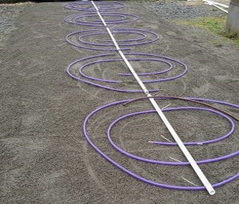 • Standard in ground system, non-mechanical and least expensive system available. • Pressure System, may or may not require a pump tank, the drain field area may be somewhat elevated (a portion of the drain field lies within the natural soils). Least expensive of the mechanical systems. • Pressure Mound, mechanical (pump tank) with elevated drain field (drain field is installed in a mound of sand above the natural grade and soils). Cost more than a Pressure System. • Sand Filter, mechanical (pump tank) with elevated drain field (drain field is installed in a contained bunker or bladder and is layered with different courses of sand and gravel. It is installed in most cases above the natural grade and soils). More expensive than a Pressure Mound. • Glendon BioFilter System, mechanical (pump tank) with elevated drain field (drain field is installed in a contained bunker covered with sand) Cost similar or more than a sand filter system. • OSCAR-LOWeFLOW™ System, is comprised of a recirculation filter, a septic tank, recirculation/mixing tank, headworks, discharge/clarifier tank, and the OSCAR unit. Wastewater is collected in a standard septic tank where gross solids are settled out and primary treatment occurs. 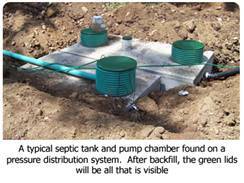 Septic tank effluent flows from the septic tank into the recirculation tank. Liquid in the recirculation tank is mixed with treated filtrate from the gravel filter. The mixed liquid is dosed to a drip tubing network called a Coil in the top of the LOWeFLOW ™ filter. Has the smallest footprint of any technology available. • THERE MAY BE SITUATIONS WHICH WILL REQUIRE COMBINATIONS OF THE ABOVE SYSTEMS. A licensed designer will conduct a soils test by digging several holes on the property in the most logical area for the Septic System to allow for a proper building site, driveways, setbacks, etc. Keep in mind that the best area soil-wise might be an area that conflicts with home placement, location of driveway etc. The designer will also find and show an area for a future drain field (reserve area) in the event the primary drain field fails. It is not unthinkable to put in double drain fields, as this will allow one field to rest and switch off between the two, this greatly reduces the chances of drain field failure. The designer will submitt a design to the Whatcom County Health Department of the soils evaluation, location of drain field and septic tank. The Health Department will conduct a site inspection of the property to confirm the submission of soils and design. If the County Health Department agrees with the designers findings they will then approve the property for sewage disposal use and a construction permit will be issued. This permit is issued after a licensed designer gives Whatcom County Health Department a detailed diagram showing the properties soils, the size and location of the drain field and septic tank. This design must meet Whatcom County Health Departments approval. The Health Department will then issue the Sewage Disposal Construction Permit. This permit shows the location of the drain field, septic tank, proposed location of the dwelling to be constructed and the number of bedrooms that the septic system is approved for. 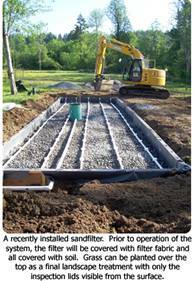 This permit allows a septic system to be installed according to the design and layout. Bear in mind that Sewage Disposal Construction Permits are issued for a given timeframe with and expriy date. One must be sure to confirm that the permit is still valid. Once a Construction permit is issued for a specific septic system, any change to the septic system and/or the number of bedrooms the house will have, a redesign must be done by a licensed designer and submitted for approval of the Whatcom County Health Department. When buying a home Sellers are required to provide the Purchaser with a ROSS (Report of System Status)/O&M (Operation and Maintenance) . Said report must not be more than 12 months old. This inspection is done in two parts, first the inspection ports on the top of the tank will be unearthed for a visual inspection of the tank, second a flow test will be conducted sometimes using dye and running water through the system to see if the drain field is working properly. It is important to confirm that while one has been provided with a ROSS (Report of System Status)/O&M (Operation & Maintenance), that the septic system when originally installed has a finale and signed off by the Whatcom County Health Department. In the event one wants to do an addition and/or rebuilt on a site, a requirement of the building permit application is providing a copy of the original septic permit as approved and showing final inspection by the Whatcom County Health Department when the system was installed. Back in the “old days”, the standard method of liquid waste disposal was to install a pipe from the house to the closest water body and let it all go down hill. After discovering this method of wastewater disposal pollutes our waterways, causes disease and can be lethal to humans and animals, newer methods were created. To help solve these initial problems, “standard gravity” soil treatment systems were introduced. This type of a system allowed the solids to settle out in a tank and the liquids to be filtered by gravity through the soil. Putting the liquid waste into the ground instead of straight into our surface water was a good first step, but other problems ensued. Sites with poor draining soils were found to sometimes “perch” a water table near the surface in the wintertime. Having a drainfield in a “perched” water table would oftentimes cause the system to back up into the house or cause pre-mature failure. On sites with excessively well drained soils (fractured rock, etc). There wasn’t enough filter material (dirt) to filter the effluent before the pollutants made it into the aquifers. This caused contamination of our ground water which was also found to be a problem. Today’s regulators have studied many of these problems previously experienced and changed the sewage regulations to help increase the life of our systems and also try and protect the public from contamination of surface and ground water. The rules are not perfect, but most have been created based on documented problems and scientific research. The septic system is a natural method of treating and disposing liquid household waste. 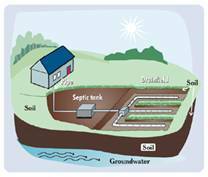 The first component of all septic systems is the tank. Most tanks are split into two compartments and have pipe baffles and an outlet filter to ensure the solids stay in the tank. The biologic process begins in the tank where the effluent separates into layers and begins the process of decomposition. Bacteria, which are naturally present in all septic systems, begin to digest the solids that have settled to the bottom of the tank, transforming a large percentage of these solids into liquids and gases. When liquids within the tank rise to the level of the outflow pipe, they enter the next part of the treatment system (pre-treatment device, distribution box, pump chamber, etc, depending on the type of system). Final treatment of the effluent always occurs in the soil where additional microbes break down the waste and the “clean” water is put back into the ground thereby recharging the aquifers. Wastewater contains several undesirable pollutants. Pathogens such as viruses or bacteria can enter drinking water supplies creating a potential health hazard. Nutrients and organic matter entering waterways can lead to tremendous growth in the quantity of aquatic microorganisms. Metabolic activity of these microbes can reduce oxygen levels in the water causing aquatic life to suffocate. Septic system regulations attempt to reduce the chance of these pollutants from having a negative impact on people and animals. The first two types (standard gravity and pressure distribution) are relatively straightforward, non-propitiatory system types. Standard gravity systems require three feet of “good” soil under the trenches while pressure distribution sytems only require two feet. Advanced Treatment systems however are a much bigger animal and can be used where there is only one foot of “good” dirt beneath the trench bottom. They come is many makes, models and sizes. Some are proprietary, name brand systems and other’s are not. Most systems today include pumps, control panels, graveless infiltration chambers and effluent filters. Some systems even include textile filters, aerobic digestion and ultraviolet disinfection! 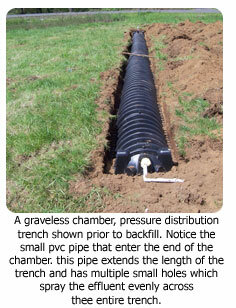 As the name implies, gravity drainfields work by letting gravity drain the effluent from the septic tank into a series of underground trenches. This means the drainfield area must be below the elevation of the septic tank. If this is not the case, then a pump is necessary and it is called a pump to standard gravity system. When you send new liquid waste into the septic tank, an equal amount of liquid (called effluent) comes out the outlet side of the tank. An “outlet filter” is installed in the tank to help prevent solids from escaping the tank. After passing through the outlet filter, the effluent flows through a distribution box (d-box) which diverts the flows to multiple pipes. The effluent leaves the d-box under the power of gravity and flows downhill to each of the underground drainage trenches. 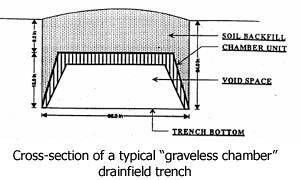 The trenches are made up of either: perforated pipe over drainrock or graveless chambers. Each type effectively does the same thing…they allow the effluent to “perc” into the ground at the bottom of the trench. By design, Standard gravity systems are progressively failing as the effluent works it’s way down the trench. 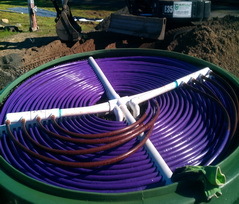 A pump (or sometimes a siphon) is used to pressurize the effluent into a small underground pvc pipe which transports it to the drainfield. 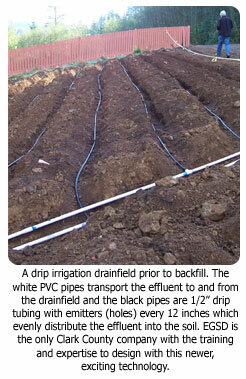 The drainfield itself consists of pipe and rock, graveless chambers or drip irrigation tubing. Unlike a standard gravity system, a pressure distribution system wets the entire length of the trench each time the pump turns on. This allows the effluent to be spread over a larger area and receive better treatment from the soil. As mentioned above, advanced treatment systems come in MANY makes and varieties. Some are built in a factory and some are built on site. Some are proprietary and some are public domain. These systems are required when shallow soils exist on the site (12-30 inches). The basic function of these systems is to clean the wastewater prior to the final disposal into the ground. Most of the time, these treatment systems are followed by pressure distribution drainfields (trenches or drip tube). Sand Filter – After the septic tank, a pump sends pressurized effluent to a large underground box which is full of sand and drainrock. Effluent is spread evenly over the surface of the sand via a pressurized pipe network (similar to a pressure distribution system). The dirty effluent filters through the sand and collects in a sump at the bottom. A second pump sends the relatively clean effluent to the drainfield where the final treatment occurs and the effluent is disposed in the soil. Sand Mounds – Another system suited for sites with shallow soils is a sand mound. 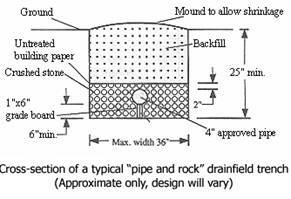 A mound is a drainfield raised above the natural soil surface with a sand fill material. Within the sand fill is a gravel bed with a network of pressurized pipes. Septic tank effluent is pumped through the pipes in controlled doses to insure uniform distribution throughout the bed. Treatment of the effluent occurs as it moves downward through the sand and directly into the natural soil beneath. 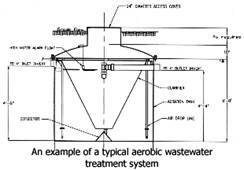 Aerobic Treatment – Another method of treating wastewater involves an “aerobic” process by which air is injected into the effluent in a specific manner. The increased levels of oxygen in the effluent allow the microorganisms to thrive and digest the biological nutrients. A small air compressor is used to inject air into the effluent. 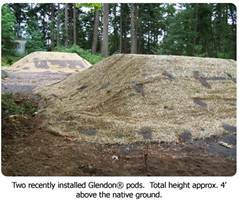 Glendon® Biofilters – Glendon Bilfilters are used on the really tough sites, typically where seasonal groundwater or significant rock is found at 12-18 inches below the surface. The system consists of different layers of sand and gravel placed in a watertight box built into the soil with a sand fill placed over the top of the entire area. Effluent is pumped into the bottom of the filter and allowed to wick itself up through the sand and over the rim of the box and into the soil (effluent remains under the cover sand). Typically one “pod” is used for each bedroom in the residence. After installation, grass can be planted over the mounds. OSCAR-LOWeFLOW™ (OS-LF) is a treatment and dispersal system that requires only 12” of soil to restrictive layer, has the smallest footprint of any technology available, and there is NO UV light! The OSCAR (Onsite Sand Coil Area Recharge) is an onsite sewage disposal and disinfection component when used with the LOWeFLOW™ treatment system. The OSCAR is comprised of a 6” layer of C-33 sand media and a series of pre-assembled Netafim Bioline™ drip tubing coils. The sand media is placed on a prepared soil surface. OSCAR coils are then placed on the sand media and then are covered with another 6” of sand media. The sand/soil interface is the discharge point of the treated wastewater. Vertical separation is measured from the original soil surface to the restrictive layer. •	Conserve water to reduce the amount of wastewater that must be treated and disposed of by your system. Doing laundry over several days will put less stress on your system and use liquid detergents not powdered as powdered form into clumps in your tank and you will need pumped more often. •	Repair any leaking faucets or toilets. To detect toilet leaks, add several drops of food dye to the toilet tank and see if dye ends up in the bowl. •	Divert downspouts and other surface water away from your tank and drainfield. Excessive water keeps the soil from adequately cleansing the wastewater. •	Have your septic tank inspected and pumped regularly by a licensed septic tank contractor. *Suggested frequency is 3-5 years. 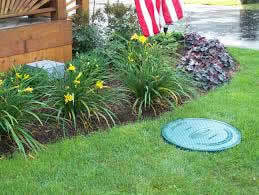 •	Keep your septic tank cover accessible for inspections and pumping. Install risers with lids if necessary. •	Call a qualified septic installer and/or designer if you experience problems with your system, or if there are any signs of system failure. •	Keep a detailed record of repairs, pumping, inspections, and other maintenance activities. Pass these on to the next homeowner. •	Don’t drive over your tank and drainfield or compact the soil in any way. •	Don’t dig around the tank or drainfield, or build anything over it, and don’t cover it with a hard surface such as concrete or asphalt. •	Don’t plant anything over or near the drainfield except grass. Roots from nearby trees and shrubs may clog and damage the drain lines. •	Don’t use a garbage disposal, or at least limit its usage. Disposals increase solids to load to your tank by about 50%, so you have to pump your tank more often than normally suggested. •	Don’t use your toilet as a trash can or poison your system and the groundwater by pouring harmful chemicals and cleansers down the drain. Harsh chemicals can kill the bacteria that help purify your wastewater. •	Don’t put in a separate pipe to carry wash waters to a side ditch or the woods. This graywater contains germs that can spread disease. Use a laundry system. •	Don’t waste money on septic tank additives. The bacteria needed to treat wastewater are naturally present in sewage. Additives can resuspend solids, causing your drainfield to clog. Additives do not eliminate the need for routine pumping of your tank. •	Don’t allow the backwash from home water softeners to enter the septic system. •	Never enter a septic tank – toxic gases from the tank can kill. If your system develops problems, call a qualified septic installer and/or designer. Pumping your septic system is critical if you wish to maximize the life of your septic tank system. As a general rule, septic tank owners should plan to have their systems pumped once every three to five years, and more frequently if a system is used more often than recommended for its size. Risers are ultimately all about convenience. They are beneficial for homeowners who no longer want to remove sod and dig several feet into the ground to access their septic tank. Instead, you can install an above-ground riser for immediate tank access (and no digging at all). Alternatively, you can install the riser 4-6 inches below ground, which allows you to grow grass over the site while still providing easy tank access. Another benefit of riser installation is that you no longer have to pay a professional to walk over your property to locate and mark out your tank lid’s location. When pumping and cleaning your tank, no labor to dig up the tank is required. Risers can be made of PVC, polyethylene, or fiberglass. We typically recommend installing risers made of PVC, which is watertight, lightweight, and strong. While concrete risers might be cheaper, they are also far heavier and can crumble and decay over time. This material is intended for informational purposes only, and should not be considered a complete discussion of these matters. It is distributed with the understanding that Point Roberts Realty Inc., is not rendering legal, or professional advice on this matter and assumes no liability whatsoever in connection with its use. It is recommended that you should consult with the Whatcom County Health Department and/or a Licensed Designer in Whatcom County. Below are the County requirements for RV Use on Lots. There are areas within Point Roberts that also have private restrictions not allowing RV Use. (1) All recreational vehicles that remain on the site for more than 14 consecutive days shall be connected to a permitted on-site sewage system or public sewer. (2) Outside of a designated recreational subdivision, maximum length of stay of any recreational vehicle on a lot shall not exceed 120 days per calendar year; provided, that no accessory guest RV shall remain on the subject lot for more than 14 consecutive days nor more than 30 days total per calendar year. Within designated recreational subdivisions, maximum length of occupation of a recreational vehicle shall not exceed 120 days per calendar year. (3) All recreational vehicles shall be screened from neighboring properties not using RVs and from public roads. Such screening may consist of landscaped buffer areas, suitable native vegetation or a fence. (4) Lots shall not be leased or rented out on a daily or overnight basis for recreational use. (5) Accessory structures within a designated recreational subdivision shall be limited to storage, shop, garage, carport and/or similar personal use only and shall not exceed a total of 2000 square feet in floor area per lot; provided, that the 200-square foot limitation shall not apply to that portion of a carport covering the RV. Outside of a recreational subdivision, accessory structures are limited to one personal storage building no larger than 120 square feet. (6) The locations of parked RVs on vacant lots shall observe normal building setback standards for a single-family residence. (7) All recreational vehicles shall be supported by their own wheels or camper jacks, and not be fastened to accessory structures. Placement of a recreational vehicle on a foundation or removal of the wheels of a recreational vehicle, except for temporary purposes for repair, is prohibited. (Ord. 2000-040 § 1, 2000). *Code reviser’s note: Pursuant to Ordinance 2000-040, Section 3, underlined text in this section sunsets 90 days from the date of ordinance adoption. Ordinance 2000-040 was adopted September 26, 2000.